Have I mentioned how much I love fall? Yeah, I know, more than once. 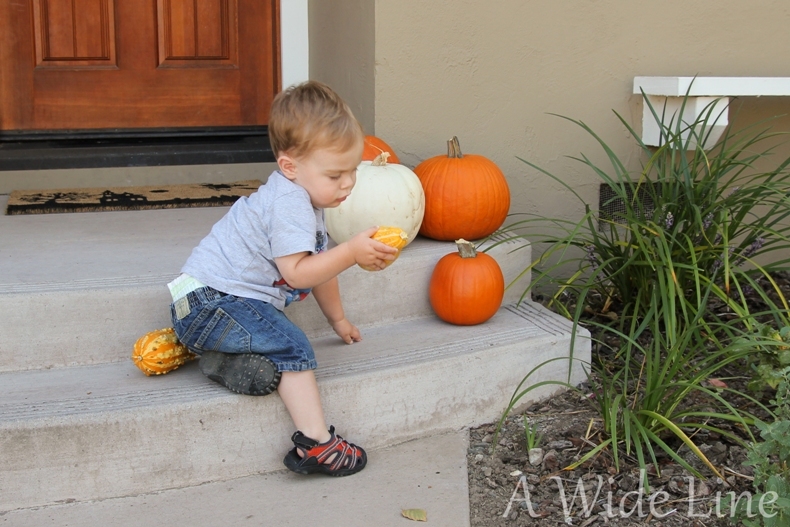 I’ve gotten into the decorating this fall, too. I blame Pinterest. I used to think wreaths were just for Christmas, but not anymore. 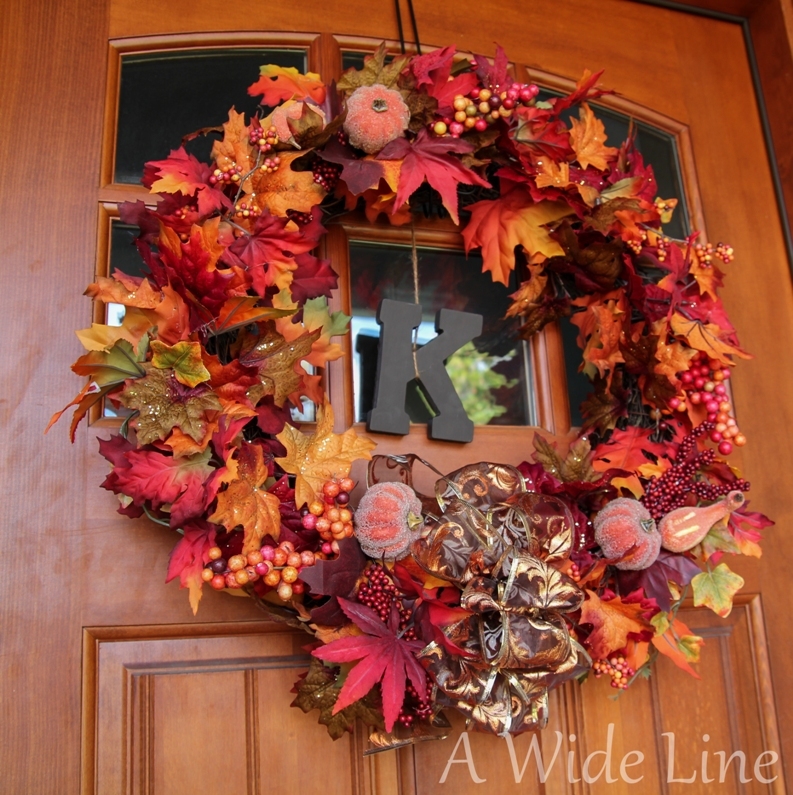 I hung a beautiful fall wreath on our front door. Did you know that you can get everything you need to make your own wreath at Michael’s? They even offer wreath making workshops and tutorials on how to tie big, fancy bows. Do you know what else they have at Michael’s? 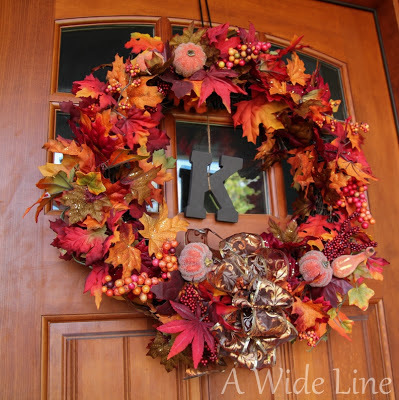 Pre-made wreaths. Oh, did you think I made that wreath myself? Ha! You crazy. After hanging this gorgeous wreath that some other crafty person made, I saw this photo on Pinterest and got inspired to add our family’s last initial. So I went back to Michael’s, found a wooden letter “K” in a font that I liked and some paint. I chose a blackish-brown color called “raw umber” instead of an orange or gold since I thought I might reuse the letter at Christmastime or for other seasonal wreaths. I painted the letter, tied it up with some twine, and TA-DA! I also love decorating with candles. When I saw this idea on Pinterest, I thought even I could do that! 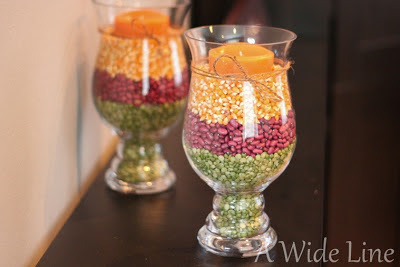 So I bought some cheap hurricane vases and candles on clearance at Target, and I found the dried peas, red beans and popcorn at the grocery store. I had left over twine from the wreath, so I tied a simple bow around the vases. The whole project cost less than $15 for both vases. I like how you can change out the candles and the filler to match any season. I think I’m going to have fun with this one at Christmas, too. 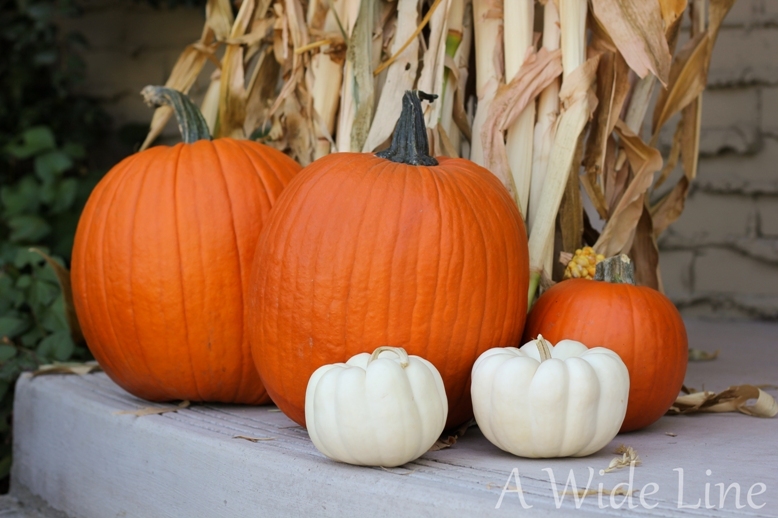 I discovered a love for white pumpkins this year. I found this wire pumpkin with a votive holder in the center a couple of years ago at a Target after-season sale. 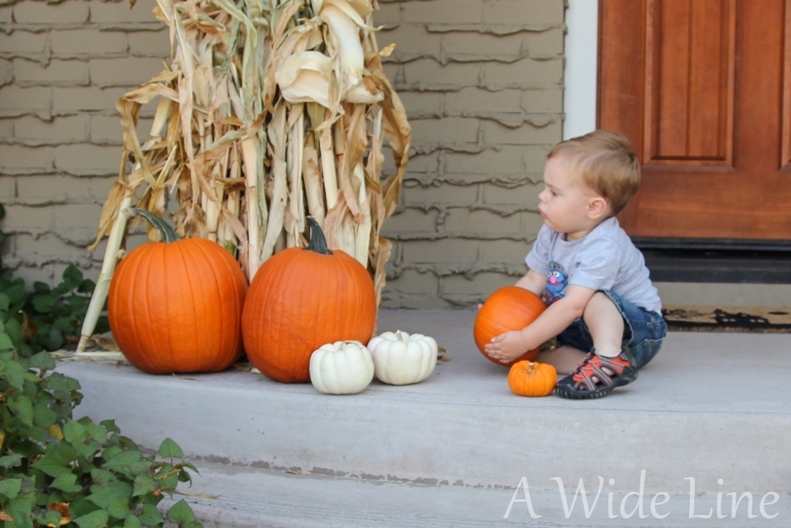 I put a white votive inside and two small white pumpkins next to it. 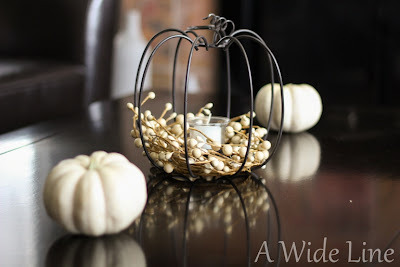 It makes a simple, pretty fall centerpiece for the coffee table in our front room, which is painted gray with dark wood furniture. This bowl of small pumpkins and gourds on the dining room table is usually the extent of my fall decorating. This year, I added a couple ears of Indian corn. 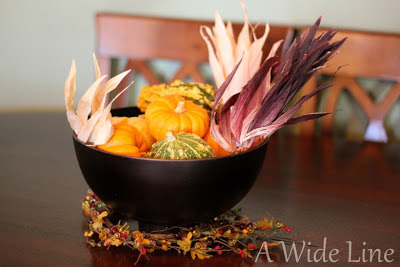 Now with all the other fall-themed décor around the house, my “gourd bowl” doesn’t look so out of place anymore. 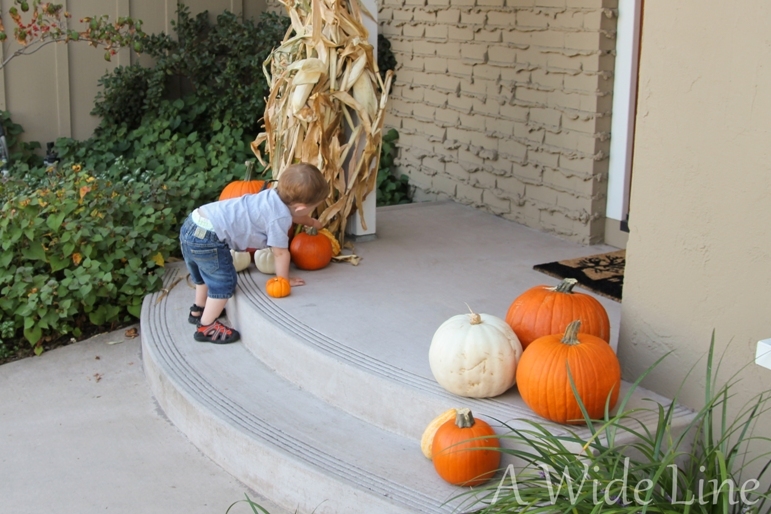 For our front porch, I tied a small bundle of cornstalks to the post and placed a few pumpkins of various sizes on the steps. I bought the cornstalks at a small local pumpkin patch for eight dollars. I wasn’t even sure they would sell them to me, but I thought I would ask anyway. Never hurts to ask! When Quinn woke up from his nap, I took him outside so he could see the new additions to the front porch. 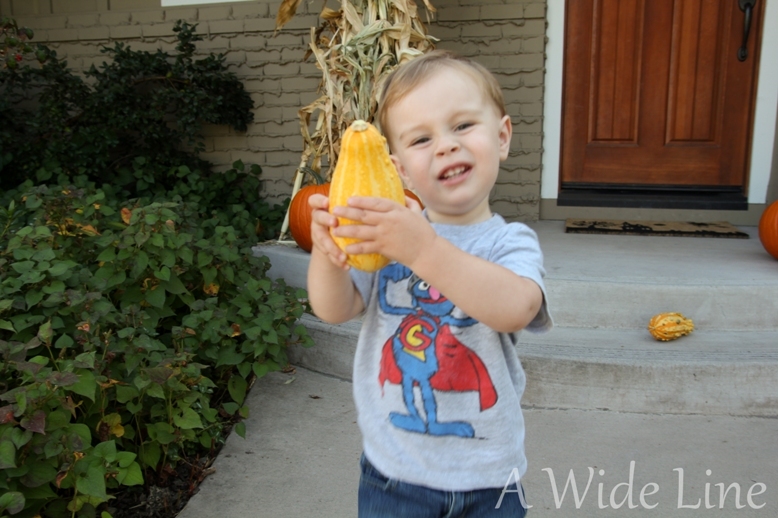 He was very intrigued by all the pumpkins and tried to lift every one of them. 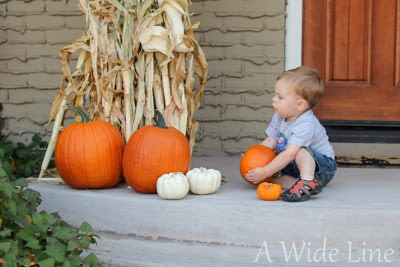 When it gets closer to Halloween, I’ll carve a couple of the pumpkins. I’m still choosing a design. I need to find one that involves using the Dremel again. That was fun last year. So that’s it. 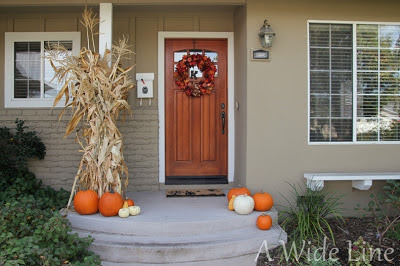 Nothing too fancy or time-consuming, but it was fun and easy to do, and it makes the house feel all cozy and fall-ish. And I felt a sense of accomplishment, which I totally needed. For this post, I tested some of my new photography skills that I learned from Amy Renea at the Springboard conference. Not bad considering I just figured out what “aperture” is, huh? For more decorating inspiration and photography tips, check Amy out at A Nest for All Seasons. Yay you! Looks great! 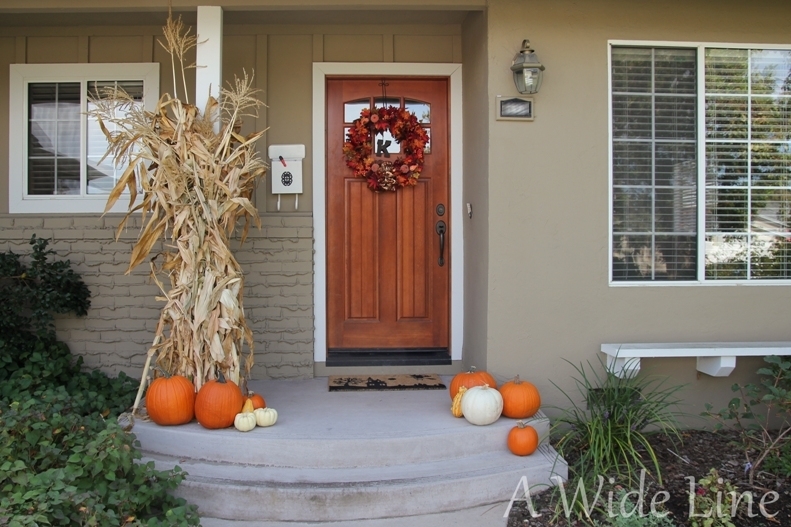 I love the wreath! Thanks! I bought it all by myself. :) I'm as creative and crafty as you only my dreams!